Emboldened by police inaction, autorickshaw drivers have returned to wreaking havoc on the streets of Bhubaneswar for the last few months. The roads of the Capital city are virtually under siege, thanks to an absolute lack of enforcement and crackdown on the menace by the police. In fact, things have turned from bad to worse with the autorickshaws blatantly violating the rules. While over-speeding has become a norm, the auto drivers are openly cramming their vehicles with passengers, cocking a snook at the three plus one norm. At stretches which are not manned by traffic police, one can find even seven passengers in an auto. In 2009, police had framed a few guidelines under Regulation 33 of Bhubaneswar-Cuttack Police Commissionerate (traffic and public order) Regulations 2008 to infuse discipline among the errant autorickshaw drivers, but this has not borned fruit. A majority of the auto drivers does not follow these guidelines, including carrying their identity cards. Almost all the junctions in the city are affected by auto menace including Vani Vihar, CRPF, Master Canteen and Rupali. Not stopping at that, they fleece the passengers by quoting exorbitant fares. There is no uniformity in fare rates in the absence of a regulatory mechanism. If an auto driver charges ` 12 from Vani Vihar to Master Canteen, another demands ` 15. “These autos are a law unto themselves. I travel by an auto every day, and even at 8.30 pm autos either refuse to come or demand ` 20 to ` 25 extra, even if there is an emergency. What’s worse is that they expect us to get off at the nearest point on the main road rather than travel into a bylane,” said Krupasindhu Muduli, a commuter. At the railway station, autos rule the roost. This being one of the busiest points in the city, an army of auto drivers waits at the exit, ready to coax passengers going near and far. There is no mechanism to control the autos as they speed and stop wherever and whenever they want to. Worse, if a passenger asks to be dropped in front of the railway station, he or she has to fork out an extra ` 15 along with the normal fare. Around 500 autorickshaws operate from the railway station daily. Another commuter, Bishweshwar Das, said the most irritating aspect with auto drivers was their misbehaviour. “The moment we point excess fare or overcrowding to them they start misbehaving, and at times even go to the extent of assaulting us. This is because the Commissionerate Police have not taken any stringent measures to streamline the system, resulting in auto drivers creating a strong network among themselves almost on the lines of a mafia,” he said. 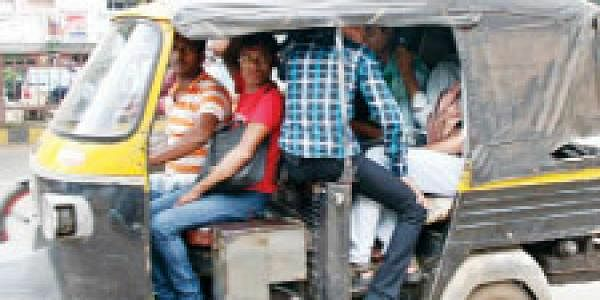 RTO Lalmohan Sethi said there are around 23,000-odd autos in the city as on today. DCP Nitinjeet Singh said Traffic Police and RTO officials are conducting joint raids on a regular basis to curb the problem. But the results are not visible on the roads as the poor commuter is being made a victim each and every day.